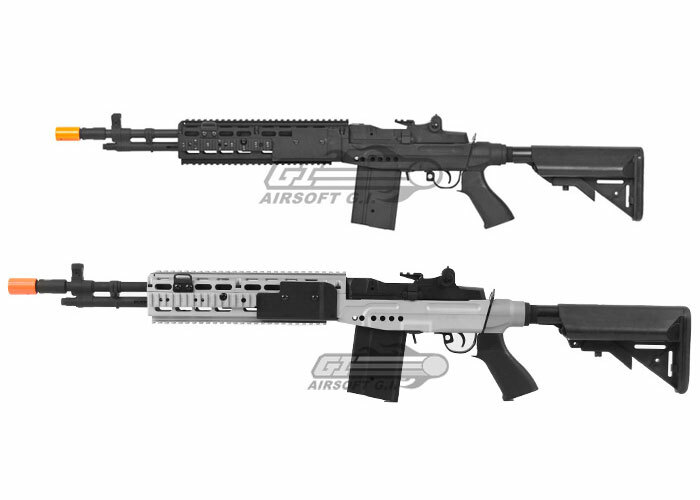 The CM032 Full Metal M14 EBR AEG Airsoft Gun is the latest addition to CYMA's already widely known M14 airsoft gun lineup, and they have really stepped up their game with it. 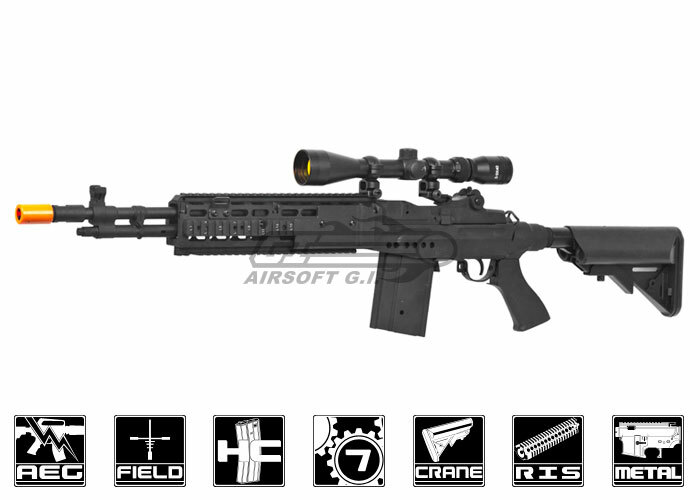 Previously, a player would have to spend upwards of $4-500 for a high quality M14 EBR, but those days are no more. The CM032 features a full metal body, along with a fully adjustable crane stock, which is where the nunchuck-style battery is stored. The RIS unit not only gives the EBR an intimidating appearance, but it is also perfect for the addition of accessories like bipods, vertical grips, flashlights, lasers, or cameras. The two-tone exterior serves to add to the gun's aggressive appearance, and gives it a look that is sure to help you stand out from the crowd. Internally, the CM032 EBR features a high quality full metal gearbox that is fully upgradeable, so it is sure to last. Overall, if you're looking for an intimidating new airsoft gun that will not only help you look like you're going to dominate on the field, but will actually help you do so, look no further than the CM032 Full Metal M14 EBR AEG Airsoft Gun. Charging handle is for aesthetic purposes only. Misuse such as dropping the item on the part may cause the charging handle mechanism to break. Product does NOT include a Scope or Bipod. This is a very nice gun overall. It is very accurate and reliable. It is Very good for someone like myself who is looking for something different from the standard M4 or AK. The internals seem to be very reliable. Nothing else. Overall a very good DMR! 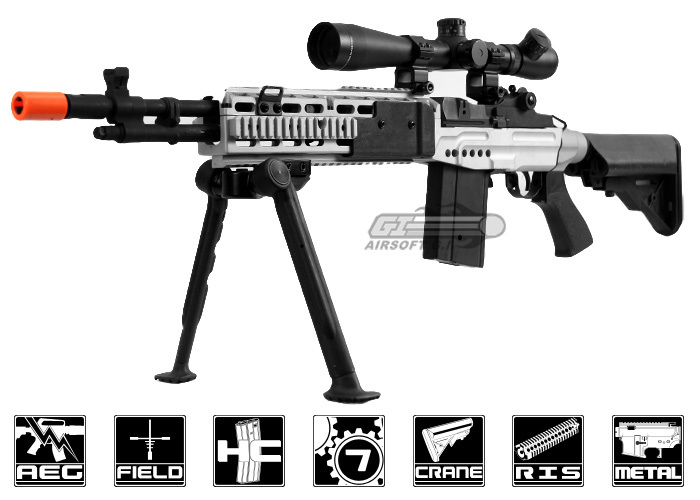 After my SAGE Int./6mmProShop EBR Mod0 broke, I went ahead and ordered this CM032 EBR. Shoot less then 1 magazine(150rd), half the teeth sheared off the spur gear. So why not buy new V7 gears, 130spring, torque motor,etc. Turns out that the spur gear in the stock gearbox is smaller then any of the V7 spur gears I've found so far. The gear exploding is likely a SNAFU so other then the hassle of finding the gears it seems worth the money. I removed the top rail on both my wounded bbEBRs and dropped them onto my real 7.62 SAGE MK14 Mod0 and of the two rails, the SAGE "Licensed" airsoft component was a drop in so IMHO the licensed rifle is of better fit&finish. If you plan on minor upgrades I'd buy which ever rifle has the stock you prefer. Hacksaw/dremmel fixes the orange tip. Since you'll wanna try to mount a foregrip-pigtailed to a taclight, bipod, IR laser, scope, and a 45degree offset microred dot youll need a sling(Magpul MS3/4) to go from single/dual sling. The stock doesnt have adjustable cheek height and it does wobble and make some noise, but you can use some teflon tape and foam inserts and problem solved.